Home » This Face Changes the Human Story. But How? Above picture: While primitive in some respects, the face, skull, and teeth show enough modern features to justify H. naledi’s placement in the genus Homo. Artist Gurche spent some 700 hours reconstructing the head from bone scans, using bear fur for hair. Composite skeleton of Homo naledi from the Rising Star cave system in South Africa’s Cradle of Humankind. Two years ago, a pair of recreational cavers entered a cave called Rising Star, some 30 miles northwest of Johannesburg. Rising Star has been a popular draw for cavers since the 1960s, and its filigree of channels and caverns is well mapped. Steven Tucker and Rick Hunter were hoping to find some less trodden passage. In the back of their minds was another mission. In the first half of the 20th century, this region of South Africa produced so many fossils of our early ancestors that it later became known as the Cradle of Humankind. Though the heyday of fossil hunting there was long past, the cavers knew that a scientist in Johannesburg was looking for bones. The odds of happening upon something were remote. But you never know. Deep in the cave, Tucker and Hunter worked their way through a constriction called Superman’s Crawl—because most people can fit through only by holding one arm tightly against the body and extending the other above the head, like the Man of Steel in flight. Crossing a large chamber, they climbed a jagged wall of rock called the Dragon’s Back. At the top they found themselves in a pretty little cavity decorated with stalactites. Hunter got out his video camera, and to remove himself from the frame, Tucker eased himself into a fissure in the cave floor. His foot found a finger of rock, then another below it, then—empty space. Dropping down, he found himself in a narrow, vertical chute, in some places less than eight inches wide. He called to Hunter to follow him. Both men have hyper-slender frames, all bone and wiry muscle. Had their torsos been just a little bigger, they would not have fit in the chute, and what is arguably the most astonishing human fossil discovery in half a century—and undoubtedly the most perplexing—would not have occurred. Lee Berger, the paleoanthropologist who had asked cavers to keep an eye out for fossils, is a big-boned American with a high forehead, a flushed face, and cheeks that flare out broadly when he smiles, which is a lot of the time. His unquenchable optimism has proved essential to his professional life. By the early 1990s, when Berger got a job at the University of the Witwatersrand (“Wits”) and had begun to hunt for fossils, the spotlight in human evolution had long since shifted to the Great Rift Valley of East Africa. What he most wanted to find were fossils that could shed light on the primary outstanding mystery in human evolution: the origin of our genus, Homo, between two million and three million years ago. On the far side of that divide are the apelike australopithecines, epitomized by Australopithecus afarensis and its most famous representative, Lucy, a skeleton discovered in Ethiopia in 1974. On the near side is Homo erectus, a tool-wielding, fire-making, globe-trotting species with a big brain and body proportions much like ours. Within that murky million-year gap, a bipedal animal was transformed into a nascent human being, a creature not just adapted to its environment but able to apply its mind to master it. How did that revolution happen? The fossil record is frustratingly ambiguous. Slightly older than H. erectus is a species called Homo habilis, or “handy man”—so named by Louis Leakey and his colleagues in 1964 because they believed it responsible for the stone tools they were finding at Olduvai Gorge in Tanzania. In the 1970s teams led by Louis’s son Richard found more H. habilis specimens in Kenya, and ever since, the species has provided a shaky base for the human family tree, keeping it rooted in East Africa. Before H. habilis the human story goes dark, with just a few fossil fragments of Homo too sketchy to warrant a species name. As one scientist put it, they would easily fit in a shoe box, and you’d still have room for the shoes. Berger has long argued that H. habilis was too primitive to deserve its privileged position at the root of our genus. Some other scientists agree that it really should be called Australopithecus. But Berger has been nearly alone in arguing that South Africa was the place to look for the true earliest Homo. And for years the unchecked exuberance with which he promoted his relatively minor finds tended only to alienate some of his professional colleagues. Berger had the ambition and personality to become a famous player in his field, like Richard Leakey or Donald Johanson, who found the Lucy skeleton. Berger is a tireless fund-raiser and a master at enthralling a public audience. But he didn’t have the bones. Then, in 2008, he made a truly important discovery. While searching in a place later called Malapa, some ten miles from Rising Star, he and his nine-year-old son, Matthew, found some hominin fossils poking out of hunks of dolomite. Over the next year Berger’s team painstakingly chipped two nearly complete skeletons out of the rock. Dated to about two million years ago, they were the first major finds from South Africa published in decades. (An even more complete skeleton found earlier has yet to be described.) In most respects they were very primitive, but there were some oddly modern traits too. Berger decided the skeletons were a new species of australopithecine, which he named Australopithecus sediba. But he also claimed they were “the Rosetta stone” to the origins of Homo. Though the doyens of paleoanthropology credited him with a “jaw-dropping” find, most dismissed his interpretation of it. A. sediba was too young, too weird, and not in the right place to be ancestral to Homo: It wasn’t one of us. In another sense, neither was Berger. Since then, prominent researchers have published papers on early Homo that didn’t even mention him or his find. Berger shook off the rejection and got back to work—there were additional skeletons from Malapa to occupy him, still encased in limestone blocks in his lab. Then one night, Pedro Boshoff, a caver and geologist Berger had hired to look for fossils, knocked on his door. With him was Steven Tucker. Berger took one look at the pictures they showed him from Rising Star and realized that Malapa was going to have to take a backseat. After contorting themselves 40 feet down the narrow chute in the Rising Star cave, Tucker and Rick Hunter had dropped into another pretty chamber, with a cascade of white flowstones in one corner. A passageway led into a larger cavity, about 30 feet long and only a few feet wide, its walls and ceiling a bewilderment of calcite gnarls and jutting flowstone fingers. But it was what was on the floor that drew the two men’s attention. There were bones everywhere. The cavers first thought they must be modern. They weren’t stone heavy, like most fossils, nor were they encased in stone—they were just lying about on the surface, as if someone had tossed them in. They noticed a piece of a lower jaw, with teeth intact; it looked human. The bones were found in a chamber named Dinaledi (chamber of stars), accessible only through a narrow chute, almost a hundred yards from the cave entrance. How they got there is a mystery. The most plausible answer so far: Bodies were dropped in from above. Hundreds of fossils have been recovered, most excavated from a pit a mere yard square. More fossils surely await. Berger could see from the photos that the bones did not belong to a modern human being. Certain features, especially those of the jawbone and teeth, were far too primitive. The photos showed more bones waiting to be found; Berger could make out the outline of a partly buried cranium. It seemed likely that the remains represented much of a complete skeleton. He was dumbfounded. In the early hominin fossil record, the number of mostly complete skeletons, including his two from Malapa, could be counted on one hand. And now this. But what was this? How old was it? And how did it get into that cave? With funding from National Geographic (Berger is also a National Geographic explorer-in-residence), he gathered some 60 scientists and set up an aboveground command center, a science tent, and a small village of sleeping and support tents. Local cavers helped thread two miles of communication and power cables down into the fossil chamber. Whatever was happening there could now be viewed with cameras by Berger and his team in the command center. Marina Elliott, then a graduate student at Simon Fraser University in British Columbia, was the first scientist down the chute. Elliott and two colleagues, Becca Peixotto and Hannah Morris, inched their way to the “landing zone” at the bottom, then crouched into the fossil chamber. Working in two-hour shifts with another three-woman crew, they plotted and bagged more than 400 fossils on the surface, then started carefully removing soil around the half-buried skull. There were other bones beneath and around it, densely packed. Over the next several days, while the women probed a square-yard patch around the skull, the other scientists huddled around the video feed in the command center above in a state of near-constant excitement. Berger, dressed in field khakis and a Rising Star Expedition cap, would occasionally repair to the science tent to puzzle over the accumulating bones—until a collective howl of astonishment from the command center brought him rushing back to witness another discovery. It was a glorious time. The bones were superbly preserved, and from the duplication of body parts, it soon became clear that there was not one skeleton in the cave, but two, then three, then five … then so many it was hard to keep a clear count. Berger had allotted three weeks for the excavation. By the end of that time, the excavators had removed some 1,200 bones, more than from any other human ancestor site in Africa—and they still hadn’t exhausted the material in just the one square yard around the skull. It took another several days digging in March 2014 before its sediments ran dry, about six inches down. There were some 1,550 specimens in all, representing at least 15 individuals. Skulls. Jaws. Ribs. Dozens of teeth. A nearly complete foot. A hand, virtually every bone intact, arranged as in life. Minuscule bones of the inner ear. Elderly adults. Juveniles. Infants, identified by their thimble-size vertebrae. Parts of the skeletons looked astonishingly modern. But others were just as astonishingly primitive—in some cases, even more apelike than the australopithecines. “We’ve found a most remarkable creature,” Berger said. His grin went nearly to his ears. In paleoanthropology, specimens are traditionally held close to the vest until they can be carefully analyzed and the results published, with full access to them granted only to the discoverer’s closest collaborators. By this protocol, answering the central mystery of the Rising Star find—What is it?—could take years, even decades. Berger wanted the work done and published by the end of the year. In his view everyone in the field should have access to important new information as quickly as possible. And maybe he liked the idea of announcing his find, which might be a new candidate for earliest Homo, in 2014— exactly 50 years after Louis Leakey published his discovery of the reigning first member of our genus, Homo habilis. The workshop took place in a newly constructed vault at Wits, a windowless room lined with glass-paneled shelves bearing fossils and casts. The analytical teams were divided by body part. The cranial specialists huddled in one corner around a large square table that was covered with skull and jaw fragments and the casts of other well-known fossil skulls. Smaller tables were devoted to hands, feet, long bones, and so on. The air was cool, the atmosphere hushed. Young scientists fiddled with bones and calipers. Berger and his close advisers circulated among them, conferring in low voices. The same schizoid pattern was popping up at the other tables. A fully modern hand sported wackily curved fingers, fit for a creature climbing trees. The shoulders were apish too, and the widely flaring blades of the pelvis were as primitive as Lucy’s—but the bottom of the same pelvis looked like a modern human’s. The leg bones started out shaped like an australopithecine’s but gathered modernity as they descended toward the ground. The feet were virtually indistinguishable from our own. But then there was the head. Four partial skulls had been found—two were likely male, two female. In their general morphology they clearly looked advanced enough to be called Homo. But the braincases were tiny—a mere 560 cubic centimeters for the males and 465 for the females, far less than H. erectus’s average of 900 cubic centimeters, and well under half the size of our own. A large brain is the sine qua non of humanness, the hallmark of a species that has evolved to live by its wits. These were not human beings. These were pinheads, with some humanlike body parts. A composite skeleton reveals H. naledi’s overall body plan. Its shoulders, hips, and torso hark back to earlier ancestors, while its lower body shows more humanlike adaptations. The skull and teeth show a mix of traits. “Weird as hell,” paleoanthropologist Fred Grine of the State University of New York at Stony Brook later said. “Tiny little brains stuck on these bodies that weren’t tiny.” The adult males were around five feet tall and a hundred pounds, the females a little shorter and lighter. Back in November, as Marina Elliott and her mates were uncovering that startling trove of bones, they were almost as surprised by what they weren’t finding. “It was day three or four, and we still hadn’t found any fauna,” Elliott said. On the first day a few little bird bones had been found on the surface, but otherwise there was nothing but hominin bones. That made for a mystery as perplexing as that of H. naledi’s identity: How did the remains get into such an absurdly remote chamber? Clearly the individuals weren’t living in the cave; there were no stone tools or remains of meals to suggest such occupation. Conceivably a group of H. naledi could have wandered into the cave one time and somehow got trapped—but the distribution of the bones seemed to indicate that they had been deposited over a long time, perhaps centuries. If carnivores had dragged hominin prey into the cave, they would have left tooth marks on the bones, and there weren’t any. And finally, if the bones had been washed into the cave by flowing water, it would have carried stones and other rubble there too. But there is no rubble—only fine sediment that had weathered off the walls of the cave or sifted through tiny cracks. Having exhausted all other explanations, Berger and his team were stuck with the improbable conclusion that bodies of H. naledi were deliberately put there, by other H. naledi. Until now only Homo sapiens, and possibly some archaic humans such as the Neanderthals, are known to have treated their dead in such a ritualized manner. The researchers don’t argue that these much more primitive hominins navigated Superman’s Crawl and the harrowing shark-mouth chute while dragging corpses behind them—that would go beyond improbable to incredible. Maybe back then Superman’s Crawl was wide enough to be walkable, and maybe the hominins simply dropped their burden into the chute without climbing down themselves. Over time the growing pile of bones might have slowly tumbled into the neighboring chamber. Disposal of the dead brings closure for the living, confers respect on the departed, or abets their transition to the next life. Such sentiments are a hallmark of humanity. But H. naledi, Berger emphatically stresses, was not human—which makes the behavior all the more intriguing. 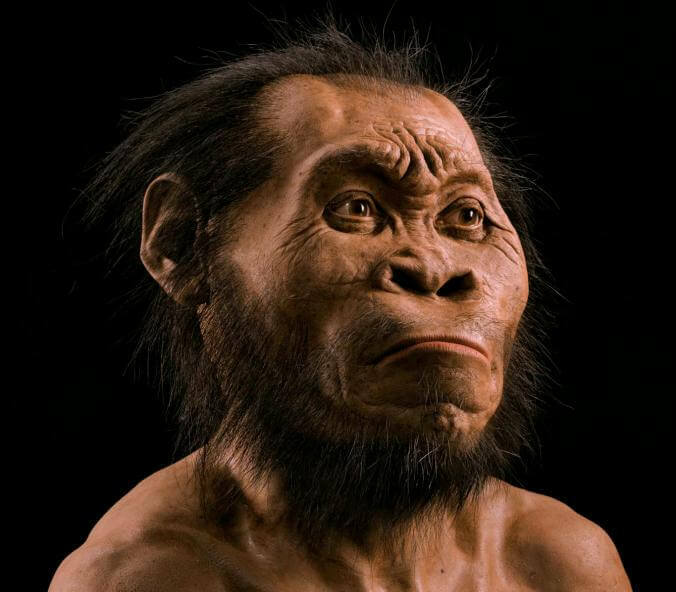 H. naledi was much closer in appearence to Homo species such as H. erectus than to australopithecines, such as Lucy. But it possesses enough traits shared with no other member of our genus that it warrants a new species name. “It’s an animal that appears to have had the cognitive ability to recognize its separation from nature,” he said. The mysteries of what H. naledi is, and how its bones got into the cave, are inextricably knotted with the question of how old those bones are—and for the moment no one knows. In East Africa, fossils can be accurately dated when they are found above or below layers of volcanic ash, whose age can be measured from the clocklike decay of radioactive elements in the ash. At Malapa, Berger had gotten lucky: The A. sediba bones lay between two flowstones—thin layers of calcite deposited by running water—that could also be dated radiometrically. But the bones in the Rising Star chamber were just lying on the cave floor or buried in shallow, mixed sediments. When they got into the cave is an even more intractable problem to solve than how. Most of the workshop scientists fretted over how their analysis would be received without a date attached. (As it turned out, the lack of a date would prove to be one impediment to a quick publication of the scientific papers describing the finds.) But Berger wasn’t bothered one bit. If H. naledi eventually proved to be as old as its morphology suggested, then he had quite possibly found the root of the Homo family tree. But if the new species turned out to be much younger, the repercussions could be equally profound. It could mean that while our own species was evolving, a separate, small-brained, more primitive-looking Homo was loose on the landscape, as recently as anyone dared to contemplate. A hundred thousand years ago? Fifty thousand? Ten thousand? As the exhilarating workshop came to an end with that fundamental question still unresolved, Berger was sanguine as always. “No matter what the age, it will have tremendous impact,” he said, shrugging. A few weeks later, in August of last year, he traveled to East Africa. To mark the occasion of Louis Leakey’s description of H. habilis, Richard Leakey had summoned the leading thinkers on early human evolution to a symposium at the Turkana Basin Institute, the research center he (along with the State University of New York at Stony Brook) had established near the western shore of Lake Turkana in Kenya. The purpose of the meeting was to try to come to some consensus over the confounding record of early Homo, without grandstanding or rancor—two vices endemic to paleoanthropology. Some of Lee Berger’s harshest critics would be there, including some who’d written scathing reviews of his interpretation of the A. sediba fossils. To them, he was an outsider at best, a hype artist at worst. Some threatened not to attend if he were there. But given the Rising Star discovery, Leakey could hardly not invite him. “There’s no one on Earth finding fossils like Lee is now,” Leakey said. For four days the scientists huddled together in a spacious lab room, its casement windows open to the breezes, casts of all the important evidence for early Homo spread out on tables. One morning Meave Leakey (who’s also a National Geographic explorer-in-residence) opened a vault to reveal brand-new specimens found on the east side of the lake, including a nearly complete foot. When it was his turn to speak, Bill Kimbel of the Institute of Human Origins described a new Homo jaw from Ethiopia dated to 2.8 million years ago—the oldest member of our genus yet. Archaeologist Sonia Harmand of Stony Brook University dropped an even bigger bombshell—the discovery of dozens of crude stone tools near Lake Turkana dating to 3.3 million years ago. If stone tools originated half a million years before the first appearance of our genus, it would be hard to argue anymore that the defining characteristic of Homo was its technological ingenuity. Berger meanwhile was uncommonly subdued, adding little to the discussion, until the topic turned to a comparison of A. sediba and H. habilis. It was time. “More of interest perhaps to this debate is Rising Star,” he offered. For the next 20 minutes he laid out all that had happened—the serendipitous discovery of the cave, the crash analysis in June, and the gist of its findings. While he talked, a couple of casts of Rising Star skulls were passed hand to hand. Then came the questions. Have you done a cranio-dental analysis? Yes. The H. naledi skull and teeth place it in a group with Homo erectus, Neanderthals, and modern humans. Closer to H. erectus than H. habilis is? Yes. Are there any tooth marks on the bones from carnivores? No, these are the healthiest dead individuals you’ll ever see. Have you made progress on the dating? Not yet. We’ll get a date sometime. Don’t worry. Then, when the questions were over, the gathered doyens did something no one expected, least of all Berger. They applauded. When a major new find is made in human evolution—or even a minor new find—it’s common to claim it overturns all previous notions of our ancestry. Perhaps having learned from past mistakes, Berger doesn’t make such assertions for Homo naledi—at least not yet, with its place in time uncertain. He doesn’t claim he has found the earliest Homo, or that his fossils return the title of “Cradle of Humankind” from East to South Africa. The fossils do suggest, however, that both regions, and everywhere in between, may harbor clues to a story that is more complicated than the metaphor “human family tree” would suggest. Berger himself thinks the right metaphor for human evolution, instead of a tree branching from a single root, is a braided stream: a river that divides into channels, only to merge again downstream. Similarly, the various hominin types that inhabited the landscapes of Africa must at some point have diverged from a common ancestor. But then farther down the river of time they may have coalesced again, so that we, at the river’s mouth, carry in us today a bit of East Africa, a bit of South Africa, and a whole lot of history we have no notion of whatsoever. Because one thing is for sure: If we learned about a completely new form of hominin only because a couple of cavers were skinny enough to fit through a crack in a well-explored South African cave, we really don’t have a clue what else might be out there.